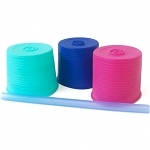 Boingo Fasteners Boingo fasteners are a fun way to fasten cloth nappies with out having to use nappy pins. 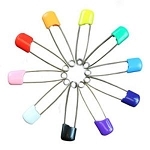 Say good bye to sharp pins and strange octopus looking devices. Boingo is here! 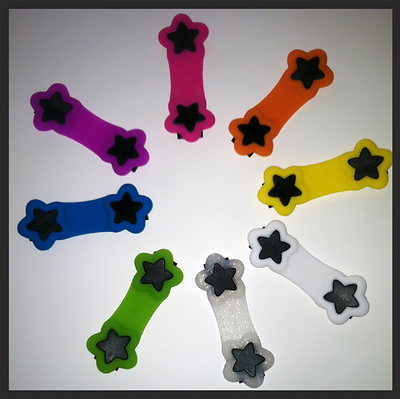 Boingos come in 9 cool and funky colors including Glow in the Dark and Glitter! 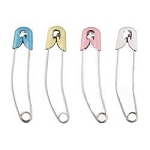 So Ditch the Pins! TM because Boingo is in! 3. Gently stretch and pull your boingo to the opposite side and fasten again. 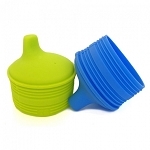 Boingos do NOT need to be fastened tightly to grip the diaper properly. 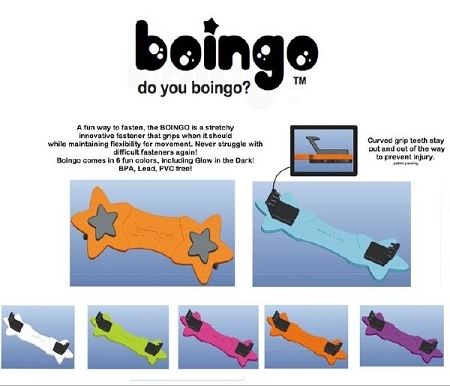 You want to have some give and stretch in the Boingo, so that it will be comfortable for baby. A good rule of thumb is that you want to be able to comfortably slip one finger under the Boingo when fastened, you should be able to pull on the Boingo and have it stay tightly gripped. You may pull on the center of the Boingo to make sure it is attached firmly. WARNINGS: Boingos should only be fastened by a responsible adult. Carefully check your Boingo prior to use for wear, or damage. Discontinue use and recycle your Boingo if it becomes worn, torn, or damaged. 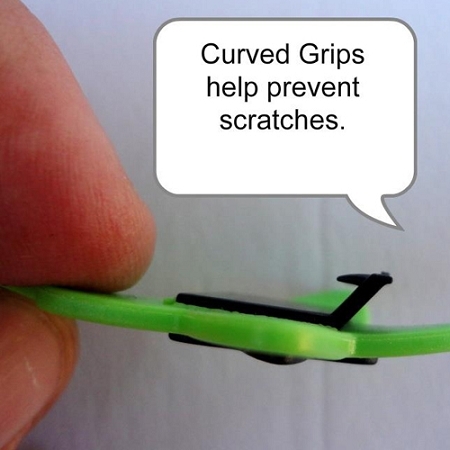 Continued use of a damaged fastener could lead to product failure, thus posing a potential choking hazard if the plastic piece is dislodged, or becomes separated. Do not over stretch your Boingos. Over stretching, or forcefully stretching will damage your Boingo. Do not pull your Boingo by any part of the star, or any other design, it will cause damage. Do not cut or alter your Boingo in any way, doing so could result in failure of your Boingo and will void your warranty. Do not use Boingo on any child who could remove it, or their diaper/diaper cover. Do not allow your child to play with Boingos, they are not toys. Boingos should be kept out of childs reach when not in use. Misuse can cause damage. WARRANTY: 60 days from date of purchase, returns for product not damaged by misuse accepted with a receipt from an authorized retailer listed on our website only. Boingos purchased through an unauthorized retailer or second hand are not covered under warranty. Way cuter than a nipper, and perfect for snapless fitteds. A must have for newborns! Q: Is the price for a single or a double pack?